Google has been pushing developers to build tablet-optimized UIs for their apps since the Xoom was the hot new challenger to the iPad (haha). Okay, so that didn't work out very well, but with the release of devices like the Nexus 7 and Nexus 10, devs are finally starting to see the value of building a great tablet experience. Of course, it's not like you'd know. The Play Store is terrible at showing off tablet UIs, but that's about to change. Google is updating the developer console to verify tablet compatibility and break up screenshots for tablet/phone interfaces. From now on developers uploading apps will have the option to verify they have adhered to the tablet UI guidelines for 7 and/or 10-inch slates. From there, screenshots specific to that version can be added. There are two main benefits of doing this. First, when you're browsing the Play Store from, say, a Nexus 7, apps that have tablet UIs built for that size device will show you the correct screens. Secondly, Google now has a way to identify tablet-friendly apps in the Play Store with the developer verification. That should make it easier to filter based on tablet compatibility. 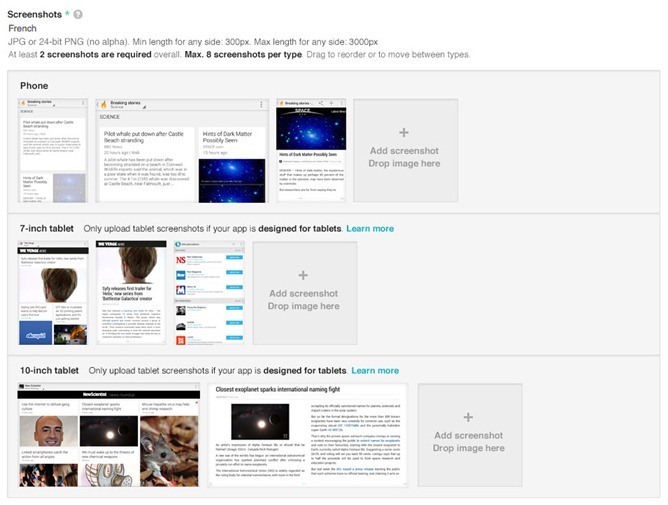 It's not clear yet how the web-based Play Store will handle the different categories of images. That's assuming there is any change at all on the desktop side.